of all the cliches about “History,” the one that most appealed to me was the assertion that we are but philosophers teaching with examples. If we take “examples” to be stories, parables, myths, art forms, or legends, the way is open to all of us to be philosophers who teach. As a confirmed cinephile, I am emboldened to take Judt’s lead and offer the occasional movie to convey what for me is important for others to consider. Nashville is a film that became relevant this past week because of the mass killings in Arizona. This 1975 film by Robert Altman has retained its position on the shelf of the memory because it is a cinematic work of art that evokes an American period of tumult when political conflict exploded into violence. The film deals with many interacting lonely souls, a characteristic Altman story. In the film Altman follows a group of individuals who for a variety of reasons, have arrived together in the city of Nashville, Tennessee. 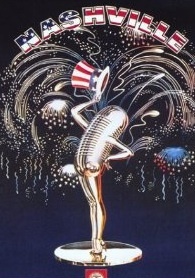 They gather in the “country music capital” at a significant moment in American political history. The film places these lonely souls on a stage, or in the audience, during a performance at Nashville’s Parthenon. They are there to hear a presidential candidate speak. More importantly, they are there to see and hear several prominent country music singers, one of whom, a young woman, is shot by a gunman in the audience. The closing moments of Nashville captures the confusion, the horror and the grief, of such an event. This is not a film “about” country music. It is a film “of” America. A review by New York Times critic, Vincent Canby, appeared on June 12, 1975. Nashville . . . . is a panoramic film with dozens of characters, set against the country-and-western music industry in Nashville. It’s a satire, a comedy, a melodrama, a musical. Its music is terrifically important—funny, moving, and almost nonstop. . . . There are so many story lines in Nashville that one is more or less coerced into dealing in abstractions. Nashville is about the quality of a segment of Middle American life. It’s about ambition, sentimentality, politics, emotional confusion, empty goals, and very big business in a society whose citizens are firmly convinced that the use of deodorants is next to godliness. Nashville doesn’t make easy fun of these people. It doesn’t patronize them. Along with their foolishness, it sees their gallantry. . . .
At the end of the film Barbara Harris, as a perpetually disheveled, very unlikely aspirant to country-and-western stardom, almost tears the screen to bits with a gospel version of a song heard earlier (“It Don’t Worry Me”) that concludes the narrative in a manner that is almost magical. A second film which fulfills Tony Judt’s call for history teaching by example, is The Apostle. In a crucial moment in this film, a traveling Pentecostal evangelist and a local citizen confront one another in the dusty church yard of a small southern Louisiana town. Before The Apostle was released in September, 1997, I arranged a theatrical screening for a national church conference in Florida. Jack Valenti, the head of the Motion Picture Association (MPAA), helped line up the theater for us. Jack had been working with the National Council of Churches and the National Association of Theater Owners, to build bridges between the film industry and the church community. This particular relationship inside a small corner of the God-Mammon dialogue, had earlier played an important role in the creation of the MPAA’s film rating program. I heard Valenti say on several occasions that the system could not have survived in its early years, “without the involvement of the churches”. The rating system was created in 1968 largely by the personal drive of Valenti, and with the support and participation of both the NCCC and the Catholic Office of Bishops. Now that 43 years have passed, the rating system is such an accepted part of the movie industry, that few people outside of those of us involved in the struggle to create and sustain the system, still connect the churches with the MPAA. The documentary, This Film is Not Related, is a badly flawed work about the formation of the system. The documentary deals with what the film makers want us to believe is the “uncovering” of the power of a rating system conducted in “secret”. The film’s creators claimed to be “shocked, shocked” by what their research discovered. They had turned up the shocking news that there are “clergy on the movie ratings appeal panel”. That shocking connection was true, but it was not new. The connection was established by Valenti when the system was created because he was convinced the system could not survive without public support. He reasoned, correctly, as it turned out, that one way to assure transparency for the system was to involve Protestant and Catholic leaders in the creation and ongoing monitoring of the system. The monitoring continues until this day. I know this, because I serve as the NCCC Protestant representative on the appeals panel, along with a colleague from the Catholic Bishops’ film office. Which brings me to that Florida clergy screening. To put that event in context, those in attendance were all from “high steeple churches” within one of our national mainline denominations. Naturally, the film’s distributors thought the film would appeal to an audience of ministers. They were only half right. It did not help that the film focused on a traveling pentecostal preacher with a dark past, a man who really believed that he had “the power of the Holy Ghost to bring others to Jesus”. In an early scene, the preacher comes across a car crash. When he rushes up to the car, he finds the driver close to death. The preacher talks quietly to the young man, urging him to “accept Jesus” before he dies. A state trooper arrives. The preacher ignores him. When the trooper persists, Duvall kicks him away, looking like an aggravated mule. This was a man on a mission; he will not move until he “knows” the dying man is with the angels. Beyond the subject matter of Penecostalism, there was the usual problem with showing a secular film in the context of a religious gathering. In spite of the many efforts of some pastors, a few religious critics and professors and the Broadcasting and Film Commission of the NCCC, to the established religious communities, movies are for entertainment and escape. The screening of The Apostle to this particular conference clergy audience, was less than an overwhelming success. I led the discussion that followed the showing of the film. While, there were some fellow cinephiles who accepted the power and wisdom of Robert Duvall’s performance as the traveling Pentecostal preacher, most did not. The Apostle was produced, directed, and written by Robert Duvall, who also was the lead performer in the film. One clip of the film depicts a central encounter in the film which is as as relevant today as it was in 1997. Since the encounter between Duvall and the character played by Billy Bob Thornton involved a bulldozer preparing to destroy a church, the encounter takes on a special significance for anyone who has been paying attention to the current and systematic destruction of Palestinian homes by Israeli army bulldozers. Toward the end of The Apostle, Duvall is celebrating an anniversary of the little church he had established in southern Louisiana. Thornton drives up in a his bulldozer, bringing with him a backup group of rough-looking supporters. They had come on a mission: They will tear down the church building. The racial tension is obvious. Most in the congregation behind Duvall are African Americans. The role that Duvall plays is of a devout Pentecostal preacher from New Boston, Texas, Eulis “Sonny” Dewey. Some plot twists force Sonny to leave his family and travel to the predominantly black town of Bayou Boutte, La. Beautifully detailed and deftly structured, every scene in “The Apostle” logically leads to the next one, each elaborating on the central theme of religious redemption. 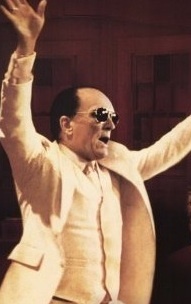 As a writer, Duvall never allows viewers to think that they know everything there is to know about E.F. Perhaps even more remarkably, he doesn’t violate the character by summing him up: Almost every scene discloses another dimension of the preacher’s complex personality. . . .
Nashville and The Apostle are films that demand contemporary reflection. One, though set in the American south, may also evoke awareness of the brutality of military occupation in Palestine. The other is pertinent to last weekend’s dark day in Arizona. Both are teaching moments in a time of unresolved conflict, confusion and public anguish. I’ve always loved “The Apostle” and your remarks make me want to see “Nashville” again after these many years. Yet I suspect that Duval’s film is as relevant to what happened in Tucson as “Nashville,” maybe even more. Our pundits are all talking about the need to “tone down the rhetoric” and there seems universal consensus that the shooter is mentally ill. Perhaps he is. And clearly there is a need for more civil discourse. But Duval’s film cuts deeper than such current cliches. It is about moral illness, vice and sin and the need for forgiveness and redemption (not only for the bulldozer driver, but even more for Duval’s preacher character who is on the run because of his vices and the murder they led to. The film (and perhaps “Nashville” too) deals with this root moral/spiritual matter and will not be sidetracked by psychological talk of mental illness and pleas for civil rhetoric. Perhape we as a country can only begin to adequately deal with the racism and classism that eat at our civic life when we have learned again to talk about vice and virtue and the real moral founcations of public (and private) life.